CT Scan uses an intricate method of x-ray taking which utilizes current computer technology. It is one of the most common imaging technologies used today for screening and diagnosing various conditions and diseases with minimal invasiveness to our patients. CT Scan uses an intricate method of x-ray taking which utilizes current computer technology. It is one of the most common imaging technologies used today for screening and diagnosing various conditions and diseases with minimal invasiveness to our patients. During the examination, the patient lies still on a moving table as the x-rays pass through the body and are read by a multitude of detectors inside the scanner. 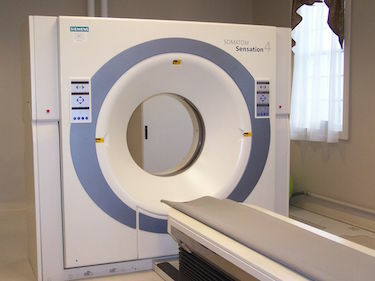 The detectors, in turn, convert these x-rays via computer software processing to produce thin slices of the anatomy scanned. The cross sectioned sliced images can sometimes be compared to a loaf of sliced of bread with each slice representing a specific segment in your body. At Tolland Imaging Center, our multi-slice Siemens CT Scanner provides our board certified Radiologists with extremely detailed images and rapid scanning time for patient comfort. Current computer software applications applied to images post-scan optimize the data and provide the radiologist with additional views for a comprehensive review and report of the exam. CT Scan uses an intricate method of x-ray taking which utilizes current computer technology.